My eyelids were slowly drooping down. 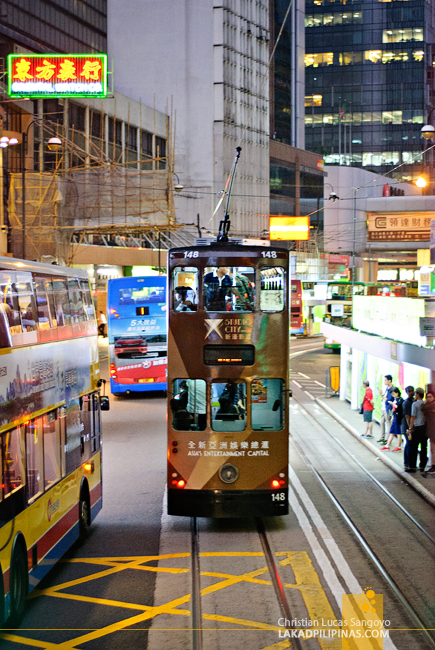 About fifteen feet from the ground, I was being lulled asleep as we made our slow and clunky way across Hong Kong Island’s urban roads, passing its glittering modernity and sidewalks busily brimming with early evening pedestrians. We were aboard an iron tram, one of the oldest transportation systems in Hong Kong and the only one in the world with a full double-decker fleet at that. And as always, we didn’t have a destination in mind. RIDE THE DING DING, SO EASY! 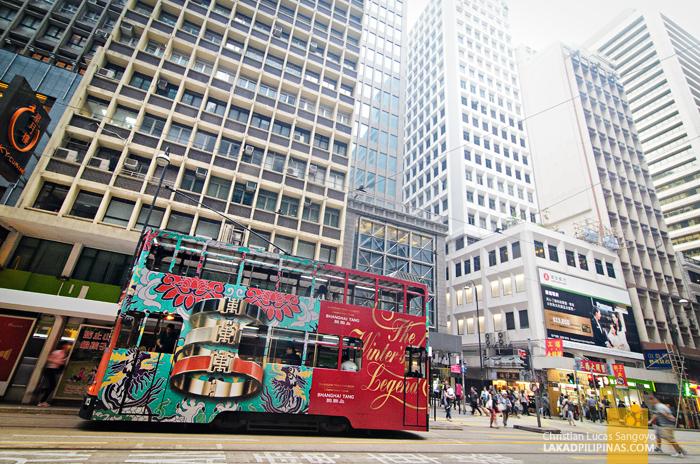 The trams in Hong Kong, charmingly dubbed as ding ding by the locals in reference to their bells, are more than a century old. The first carriage ran across the northern coastline of the island, before it eventually went inland due to land reclamation, in 1904. Those were single-deck cars back then, shipped all the way from the United Kingdom. The first double-deckers were not to emerge until eight years later. 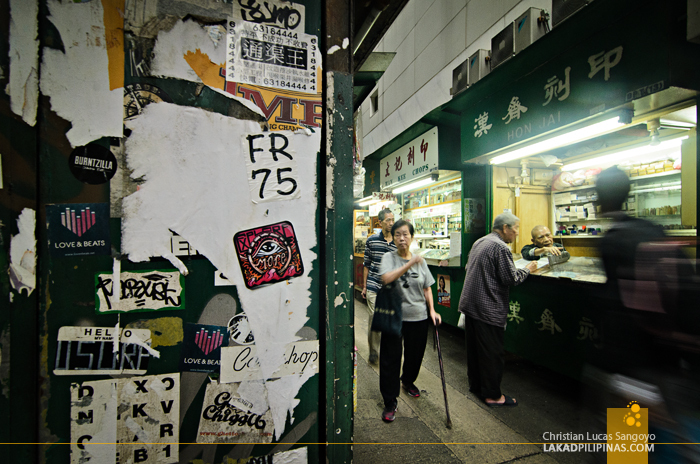 What started as a jaunt to find an old movie theater running mildly sensual movies at Yau Ma Tei, eventually led us to Man Wa Lane or Chop Alley. 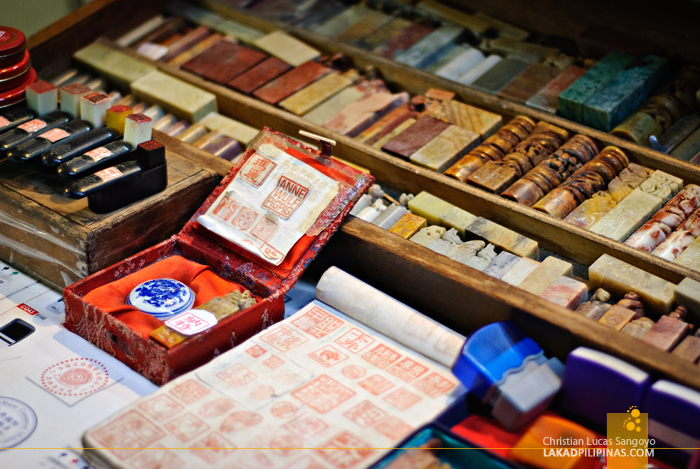 We passed by several small stalls selling rubber stamps and traditional Chinese seals, ogling at the intricate devices as we went along, when someone suggested that we ride a tram. 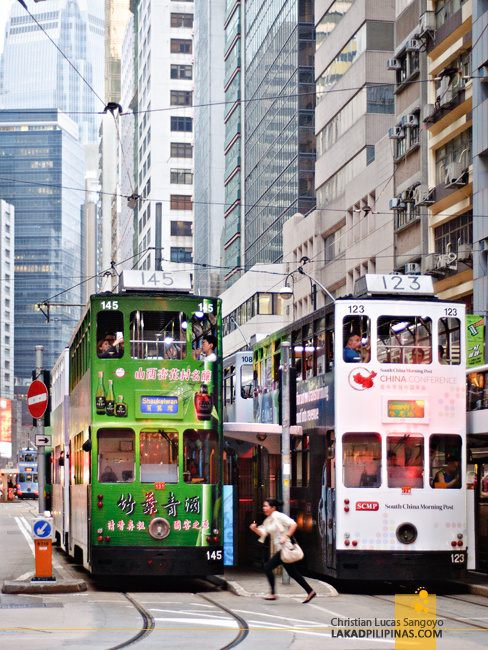 The idea quickly garnered attention, we were in Hong Kong after all and it seemed a sin not to travel using these iron dinosaurs. So off we went, trotting to the nearby Western Market where a lot of trams seem to be stopping by. We have no idea where they’re heading but we boarded anyways. Quickly counting our coins, we dropped HKD 2.30 (PHP 15.00) flat rate on the coin box and headed on the upper deck of the tram. We weren’t that worried on getting lost, we presume, that since these cars are on track, we could easily go back the way we came from. What we didn’t expect was how slow these trams are. 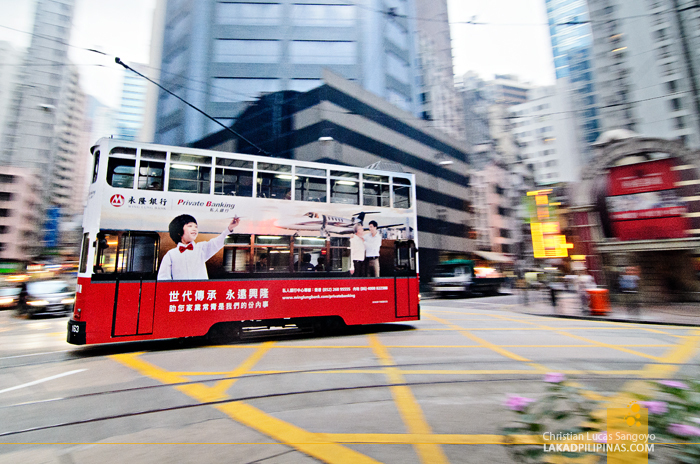 We breezed through the crowded Hong Kong roads at a mere 35 kilometers per hour. A bike could’ve overtaken us. Well, I’m kidding, but it is painfully slow. The good thing about it was that we weren’t in a hurry, having no evening itinerary in mind. These trams used to be built from teak wood and have an open-decked second floor. Now, the its shells are mostly made from metal covered with advertising decals, with the second floor, roofed. There are no air-conditioning and the seats are molded plastics, similar to those used in trains. Surprisingly, even with these, a ride on one is quite comfortable, the chilly evening air wafting through the windows providing easy ventilation across the whole deck. 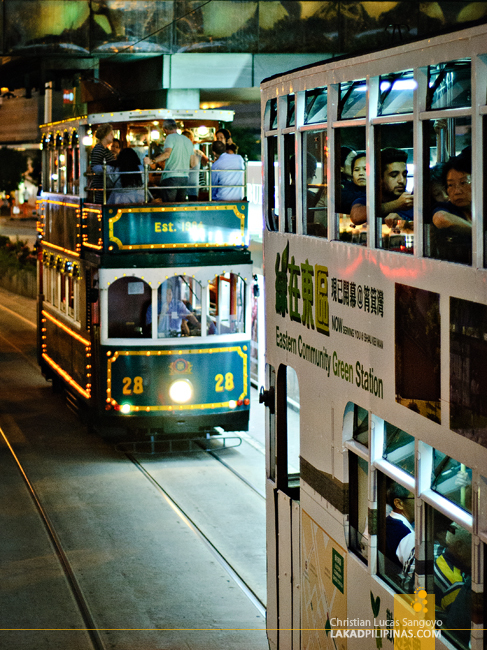 Besides the usual commuter trams, there are two special trams, the green and red open-decked antique trams, that tourists and locals can hire for a guided tour, parties and special occasions. These are quite expensive though, with an hour’s rate of about HKD 1,000.00. 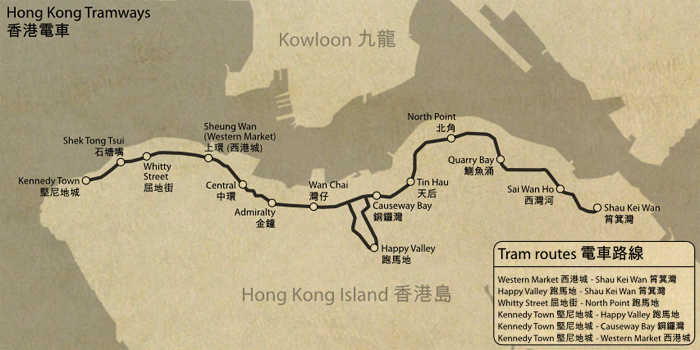 From Hong Kong Tramways’ website, I also saw maps detailing places you can stop by depending on your interest; art stops, colonial journeys, family-friendly places, food trips, heritage jaunt, nature tripping and of course, shopping destinations. Currently, there are a total of 120 stations, set at an average interval of a quarter of a kilometer each, running through its 13-kilometer length. 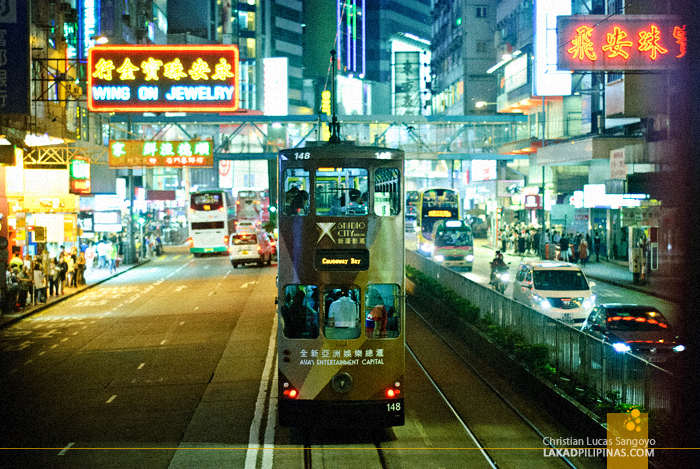 The trams only run at the Hong Kong Island side of the country from Kennedy Town to Shau Kei Wan. 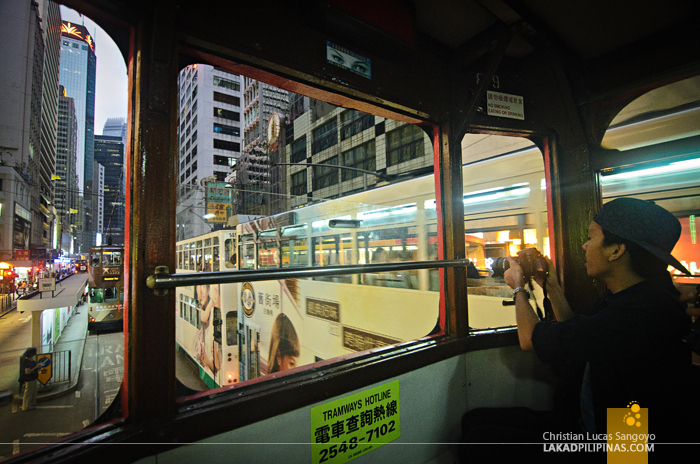 We boarded a fourth of the way from the Kennedy Town side on the Sheun Wan station and it still took us, with all the stops, about an hour to reach the area around Causeway Bay where we hastily decided to alight. It was an interesting albeit rumbly and slow ride nonetheless; a superb and very traditional way of seeing a cross section of the bustling city without breaking the bank. You just board one, take a seat with a good vantage and watch the city leisurely roll by. As their slogan says, Hop on 1. $2.3. Tram so easy! Ding ding, let’s go!